Wooden Slide Whistle is a lovely traditional musical instrument. 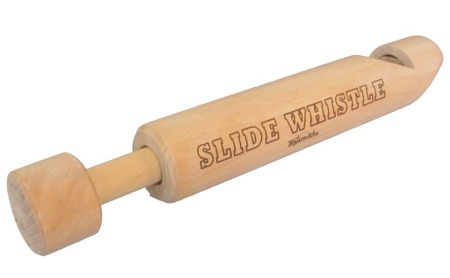 This Slide Whistle has a gentle sound (won't drive you nuts) is beautifully smooth, well finished and is made from untreated wood. You blow into it and move the slider in and out. It produces a note which climbs up or down depending on whether you pull the slider in or out. This is the instrument sometimes used to make sound effects that accompany characters in cartoons when they jump up and down or fall off something. We like this because: "Really fun making sound effects"